Presentations are a key part of running a business but let’s be honest very few of us are graphic designers and able to create the amazing visuals we see in some PowerPoint presentations. So how do we give our presentations the wow factor without enrolling on a design course? Here’s 10 practical tips that will help transform your PowerPoint presentations. Think about what information you want to give to the audience and make a list. Use these to storyboard out your slides, so that each point is covered, and they flow in a logical and concise way. These points could be the USP’s of your product, areas you would like to raise for discussion or the core strengths of your business. This one may seem obvious, but make sure you choose a font that is clear to read. An interesting font is a great way to make a presentation look well designed, but the most important thing is that everyone can clearly read what’s written. You should also consider the tone of your presentation – a zany font may look exciting, but if your presentation is on Health and Safety, it may not be the most appropriate. A bit like fonts, it’s important to choose colours that don’t detract from the messages you are trying to get across. Consider choosing two colours that work well together – a main colour and an accent colour that can be used to highlight key points or areas of the slide. When used throughout the presentation this will help bring all the slides together creating a professional look. It will also stop the design from becoming over-busy with different colours. Robert Lane from Aspire Communications provides a great article in the PowerPoint help section that goes further explains the effective use of colour in presentations. – If you have a banner (like your email address at the bottom) make sure this is in the same position on each slide. These are simple points, but they make a huge impact. Also, if your company has any set brand guidelines (company font, logos, colours), it’s important to follow these as it all helps build your brand awareness and identity. We have all been in a ‘death by PowerPoint’ presentation. The kind where we sit for one or two hours as the presenter reads out the text on the screen. No-one enjoys it and it doesn’t help get over your message. To avoid this look at the presentation as more of a visual support. Add in pictures of your products while you talk about them, include videos to break up the presentation and bring in some music to break things up. Use the slides to back up what you are saying, rather than a script. Templates are a great way to start off your presentation. There are some helpful ones available from Hubspot, that will give you lots of design inspiration and provide basic slides that you can add text to. If you are feeling creative, you can also adapt them to suit your design ideas. There are four different ways in which people absorb information and your PowerPoint presentation should try to address them – visual, audio, reading/writing and kinesthetic. Incorporating pictures, graphics and video, including an audio track or sound effects as well as the basic text should accommodate the learning styles of everyone in your audience. Kinesthetic is learning by doing, so you might want to think about a practical exercise within your presentation as well. It sounds like a no-brainer, but sometimes it’s difficult to spot errors after we have worked on a presentation for so long. Take the time to proof-read all the slides thoroughly, ensuring there are no spelling mistakes, grammar errors or typos. Mistakes always look so much worse when they are on show on the big screen. Proof-reading is also particularly important if several people have contributed slides to ensure that it all flows correctly once combined and that you have picked up any inconsistencies or errors. Try not to overload a slide with too many messages or text, as it’s unlikely that any of the information will have the impact on the audience you want it too. If you have a lot of information to get across, try producing a handout that you can email to everyone after the meeting (also a great way to follow up!) or you could produce two or three slides to cover the point instead. The best presentations slides are clear and convey a simple message. Like photos and videos, animations are a great way to liven things up and help to explain more complex ideas, such as sales funnels or factory procedures. They are simpler to create than you think and there are some useful video tutorials on YouTube that give step-by-step guides. My top tip to creating animations is to plan out how you want it look and flow, next design all the content and finally add in the animation actions. Depending on the context of your presentation, it’s a good idea to get people interacting and asking questions. This can sometimes be easier said than done, but if you want to get feedback from the audience, you’ll need to plan this into your presentation from the start. You can also use free software like Sli.do to run interactive polls and collect questions. I’ve used it at a few different events, as it’s simple and effective. There’s a lot to think about when designing a presentation, but hopefully these tips will help you create something engaging, that will get your points across. 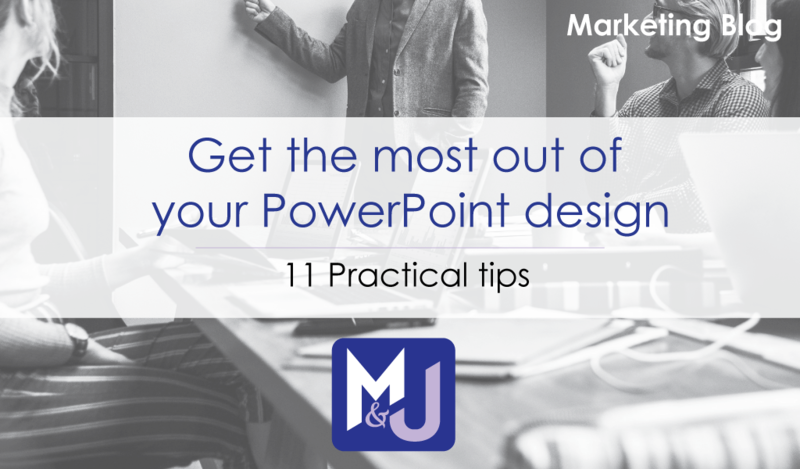 If you would like more advice or guidance in creating presentations, email ruth@martinandjonesmarketing.com for some creative advice or sign up to get more marketing tips from our blog. Happy designing!